A spider seems to have moved into the driver-side mirror on my car, and no matter how many times I clean the webs off, in a day or two they are back. 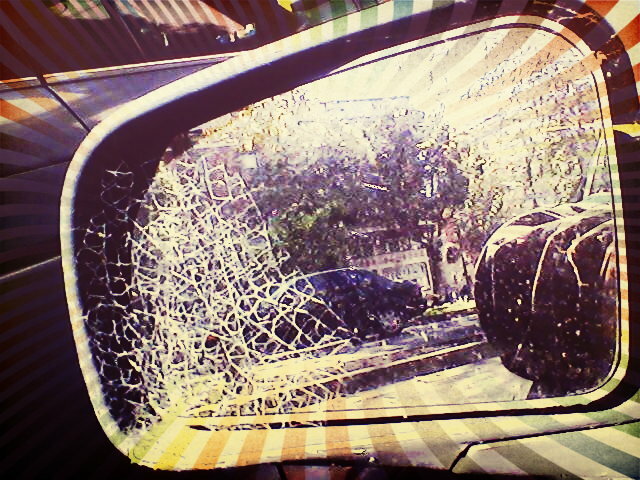 I even took it to the car wash, and the spiderwebs were still back in a very short period of time. Days, even. Less than a week. You know what else? This is a digression… kind of like the three interludes in the Wife of Bath, which we studied and had a quiz on last week. A quiz on which I did abominably. Which is why this blog post is going to not be much longer: I’ve been swamped under a huge pile of homework, studying, reading, and writing thesis papers. When I went to my niece’s party at school, I had to actually bring my homework to her school. See what I mean? Usually, I try to keep my life compartmentalized. But it’s become very decompartmentalized this week. Nuff said. ~ by Sumiko Saulson on September 22, 2012.